The lives of Sharla and Michael Hank changed forever when their son, Adam, was born with Down syndrome. Three years later, their world would again be turned upside down — a blood test would reveal that Adam had leukemia. Leukemia, a cancer of the blood, is one of several health conditions associated with Down syndrome. Just eight days before Adam’s third birthday, he was diagnosed with acute lymphocytic leukemia (ALL), the most common leukemia in children under age 15. Adam takes oral chemotherapy every night and goes to the Peckham Center for Cancer and Blood Disorders at Rady Children’s Hospital-San Diego every four weeks to receive chemotherapy through a portacath in his chest. Every 12 weeks, he goes in for preventive chemotherapy in his spine to prevent any cancer cells from growing there. Adam was put on a three-year treatment plan, and is expected to complete treatment next summer, said Amy Geddis, M.D., Ph.D., a Rady Children’s oncologist and associate professor of pediatrics at the University of California, San Diego (UC San Diego). She noted that Adam’s care has been a collaborative approach. Dr. Geddis added that Rady Children’s is part of a national group of children’s hospitals that shares treatment protocols for cancer and participates in studies that are available through this organization. Through his long treatment, Adam has been the ultimate trouper. Adam not only brings smiles to everyone around him, but is an exceptional learner. When he was just a year old, Adam began using American Sign Language to enhance his ability to communicate. By age 2, he had learned more than 200 signs and is now teaching little sister, Nicole, to sign. After learning that Adam had Down syndrome, Sharla and Michael joined with other local families to form DS Action, a local nonprofit organization that partnered with Kristin Gist, senior director of Developmental Services at Rady Children’s, to develop the concept of a Center of Excellence for children with Down syndrome. DS Action worked to raise money for such a center, and on Jan. 15, 2008, the Down Syndrome Center opened at Rady Children’s. The Center provides health and social services, developmental screening and referrals to developmental mental health and medical services for children up to 5 years of age. 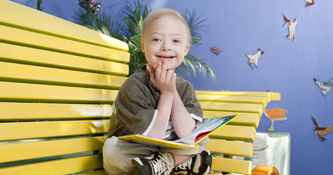 It is also the only comprehensive Down syndrome center in San Diego. Along with Dr. Bird and an otolaryngologist, the Center has a wide range of health professionals. These professionals — occupational and physical therapists, a speech language pathologist, a social worker, pediatric dental residents, and genetic counselor/case managers — are supported by DS Action, Gist noted. One in every 733 babies in the United States is born with Down syndrome, according to the National Down Syndrome Society. Along with experiencing delays in cognitive development, children with Down syndrome have a higher risk for developing medical conditions including congenital heart defects, respiratory conditions and thyroid disorders. Adam, who is now 5 and attends kindergarten, has had a lot to deal with at such a young age. He is an inspiration to his parents as well as to his medical team and therapists. It has been “very emotional” for Sharla to see Adam on steroids and chemotherapy, but she is grateful for the incredible care he has received at Rady Children’s. “It’s scary, but we know that everyone will take care of us,” she said. And as far as Adam is concerned, he is happy to see his friends.